The Vodafone World of Difference Programme launched in November 2002 and finished in March 2018. Over that time, the programme enabled more than 80 passionate people to work for a New Zealand youth charity for one year. The Foundation supported them financially and professionally so they could concentrate on creating change. Being one of the final five World of Difference recipients changed my life and our relationship with the Vodafone Foundation transformed our organisation. For the first time, we were able to have a full time staff member (for a WHOLE YEAR) and this alongside the incredible learning led to massive change. Not worrying about the funding for me as CEO meant we could channel other funding to employing part time staff and developing our programmes to make more of an impact. Being a Vodafone Foundation Community Partner opened doors and introduced us to what was possible, to dream bigger and to reflect on what we could do better. We still have A LOT to learn but 2017 and the WOD accelerated this beyond what we ever considered possible. 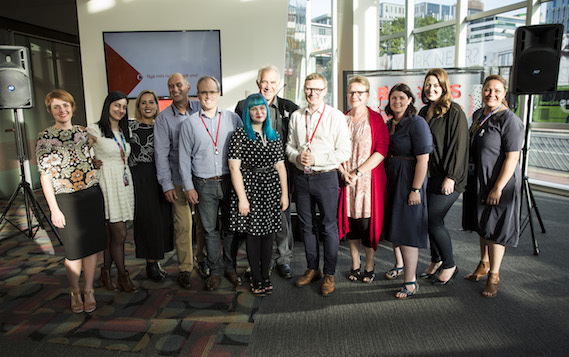 We had funding for professional development that meant I could travel to the World Anti Bullying Forum and re connect with the Diana Award team in London, learn more about the Not for Profit sector here in NZ and connect with phenomenal organisations here in Aotearoa. Vodafone Hui and opportunities to collaborate were practical and inspirational (an unusual pair I know). The personal support was incredible, from being connected to a mentor within the Vodafone Foundation team to receiving regular professional supervision and connecting with the other WOD recipients and the Foundation team to grow my own skills and enable us to better grow our work. Though it was certainly overwhelming at times, I would not change it for the world. For every moment that my to do list felt never ending, the opportunities that made up these lists exceeded any of the goals that our passionate team had even dreamed back in 2013. The difference that 2017 and WOD made cannot really be measured, it has enabled us to think nationally and to understand how this might be possible. It opened the door for our first app (ICON our free web support tool) and for our Online Training Platform (It Starts with You), understanding how we can harness technology to spread our work and grow our movement. Being part of the WOD alumni and the Vodafone Foundation whānau is something that I feel immensely proud of and one that I will never forget. Thank you to Lani, Antony, Cris, Josh, Rach and the Foundation team for taking a chance on me and for your belief in what we do, cliches aside, there really are no words that can truly express what it has meant.